A new exhibit opened on March 1st in the Visitor Center at the Historic Courthouse in Woodstock, Virginia. The exhibit is by Shentel – Shenandoah Telecommunications Company – one of the oldest businesses in Shenandoah County. This small display is from the museum at the Shentel Center, 500 Shentel Way, Edinburg, Virginia, where they celebrate the early years as a telephone company. In 1902, a group of farmers joined together to create Farmers Mutual Telephone System. There was telephone service in the towns at that time, but not in the rural areas. From those humble roots Shentel has emerged as a company that offers a broad range of diversified telecommunications services through its high speed, state-of-the-art network to customers in the Mid-Atlantic United States. The Company's services include: wireless voice and data; cable video, internet and voice; fiber network and services; and local and long distance telephone. Shentel is the exclusive Personal Communications Service (PCS) Affiliate of Sprint in portions of Pennsylvania, Maryland, Virginia, West Virginia, Kentucky and Ohio. A 1959 telephone directory, an actual dial telephone and other items are also on display. The exhibit will be on display through June of 2019. • Foster a spirit of cooperation between existing organizations, writers, historians, genealogists, collectors, preservationists, and other members of the Shenandoah County community. • Aid in the collection and creation of materials and publications about the history of Shenandoah County and ensure that they are preserved and made available to the community. • Support efforts by citizens, organizations and government to preserve historic buildings and sites. • Share history through programs and exhibits. The Shenandoah County Historical Society was founded in 1985 and is established as a 501(c)3 non-profit organization. It is completely volunteer driven. The Society is sustained by memberships, donations, grants and profits from book sales. All donations are tax deductible to the extent allowed by law. Formerly Mt. 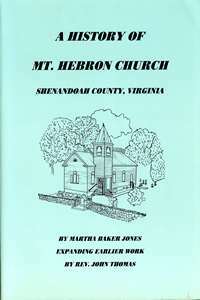 Hebron United Brethren in Christ, Shenandoah County, Va. 1996. 176 pages. 8 1/2 x 11. 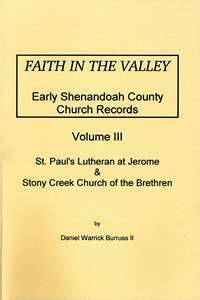 Early Church Records. 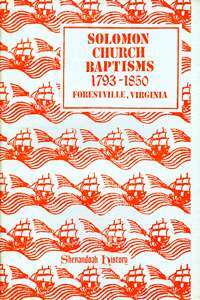 United Brethren Churches of Old Edinburg Circuit (1796-1949), Edinburg, Otterbein, Conicville, Hawkinstown, Columbia Furnace, Mount Hermon. 1998. 137 pages. Local History and Heritage groups, in cooperation with the History Council of the County Library and the County Tourism office, are participating in a weekend event wherein all of the county museums will be open to visit. The museums open from 11 AM to 5 PM are the Strasburg Museum, Hupps Hill, Woodstock Museum, the Museum at the Edinburg Mill, and the Fort Valley Museum. The Historic County Courthouse will open fron 11 AM to 7 PM, the Mt. Jackson Museum from 1 to 4 PM and the County Library from 10 AM to 3 PM. A "Hunt for History" will be part of the event, where visitors will be able to earn prizes based upon how many sites they visit. For info: 5400-984-8200. The 2019 Dinner Meeting of the Shenandoah County Historical Society will take place at the VFW Post 2447 in Edinburg, VA on this date. The social hour is at 6:00 PM and dinner will be served at 6:30 PM. Following dinner, historian and author Daniel Bly will speak on "What We Can Learn from Local History. Dinner is $23 and reservations are required. A reservation form can be found on the SCHS web site: WWW.schs1795.com Form is located under INTEREST AREAS, then click on NEWSLETTERS. The French & Indian War Foundation and the Community History Project of Shenandoah University are presenting Dr. Glenn F. Williams, who will speak about his latest book, Dunmore's War: The Last Conflict of America's Colonial Era. The award-winning historian will explore the causes and conduct of the last Indian War before the American War for Independence. 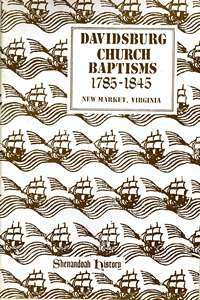 A book signing will follow the lecture, which will take place at Stimpson Auditorium, Halpin-Harrison Hall of Shenandoah University, 600 Millwood Avenue in Winchester, VA. The event if free and the public is invited.